Wisdom of Life. : What is Santa Claus? When I was a little boy, I believe in Santa Claus. He brought me gifts and presents, and he made me so happy. Later when I went to school, getting through exams and doing well in studies was like Santa Claus to me. As I grew, attending parties and getting beautiful girl friends was Santa Claus to me as well. Finishing my education and gaining a good job was Santa Claus connection. I got marry quite young and by the time I was 35, Santa Claus gave me three grown up sons. All my children completed their decent degrees, and later they themselves got marry with six grand children for me. I believe all these were possible because Santa Claus was there to bless me with happiness and joy. Today, instead of believing in Santa Claus alone, I became a Santa Claus myself. I no longer wait to be given but rather I have learned to give and to share with those who need my assistance and help. For those little children that are deprived of gifts and presents, I would give mine to them. For those who are sick and jobless, I would give my hand in every way possible. For those who are down or at lost, I will try by very best to offer my advices and suggestions. For those I can't reach them, I would write in my blog to share my wisdom and knowledge which might be useful in their lives. 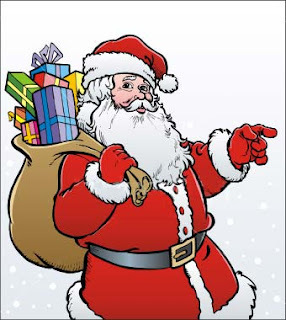 In the spirit of Xmas, Santa Claus has taught the world to give and to share willingly. It's by giving and sharing, we learn and to understand the truth of Happiness. The beauty of life does not depend on how happy you are but on how happy others can be because of you. Thank you for your wishful thought & you have a wonderful holiday too.